Gordhandas, Kishor N. is an enthusiast and avid collector of Playing Cards. 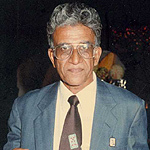 He has written on the subject and has been a first prize recipient in the Visual Arts department for his two part article on the story of Ganjifa; he has delivered illustrated talks at museums and craft centers; displayed his collection; demonstrated the method of playing the Moghul Ganjifa game; and participated in several workshops. He has been a member of the International Playing Cards Society, London. since1981. He also collects Hand Fans and Puzzles.